Kinlcoh Castle – our home for almost a week. Forty square miles of moor and mountain with a population of only around twenty. Well this was to be our home for almost a week in April 1980. 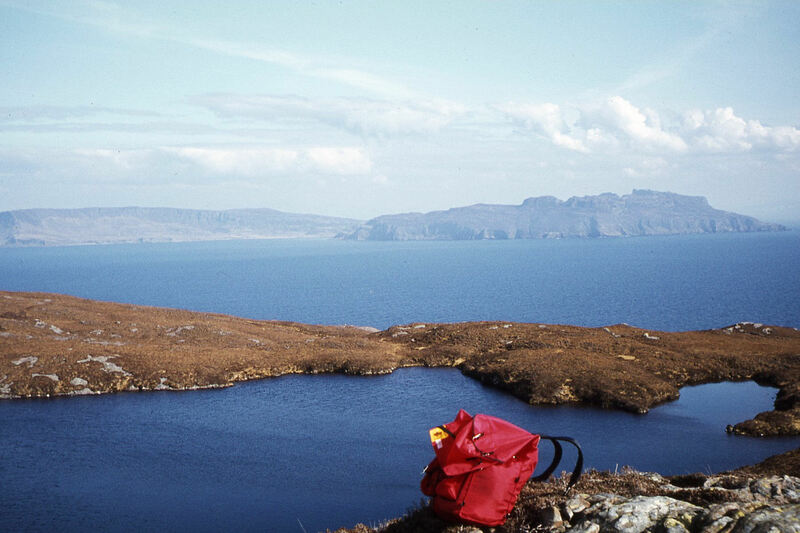 I had organised a party of seven from my local walking club at the time to spend several days exploring this very remote island in the Hebrides. 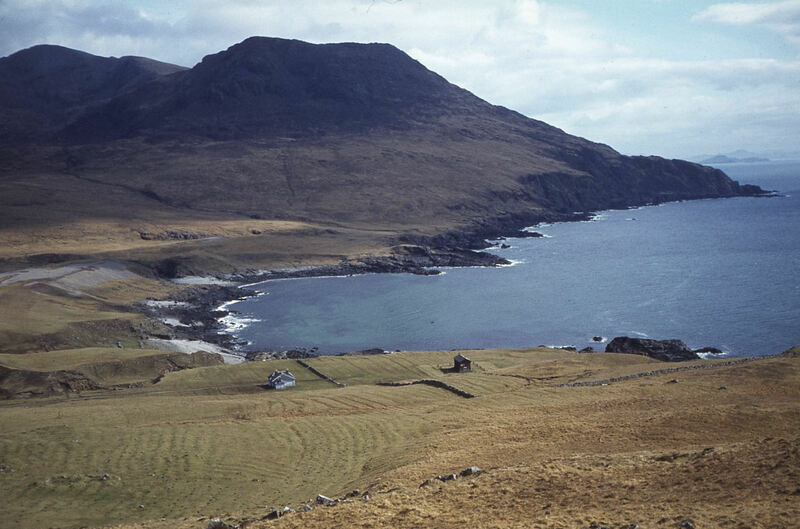 Rum (or Rhum as it was called until 1991) is the largest of the Small Isles which lie between Skye and the Ardnamurchan Peninsula. The other three islands in the group also have unusual names and are named Eigg, Canna and Muck. Getting to Rum was a small expedition in itself and loaded into two cars we set off north from Bristol taking three days to reach Mallaig. With no shop on Rum, we were going to take all provisions for the expedition to last us the week. So on a cold April day we were ready at Mallaig with twenty one items including suitcases, rucksacks and boxes of food to board the Caledonian Macbraynes Ferry which serviced the Small Isles. After a uneventful voyage we needed to transport all our supplies from the ferry to a smaller boat out in Loch Scresort as in 1980 the ferry was too large to come alongside the small jetty. Once safely ashore, our provisions and everything else that we had brought with us was loaded into a land rover for the short journey to Kinloch Castle. As for us, we had to walk along the track to the only community on the island. The former servant’s quarters in Kinloch Castle would be our home for the week. We had now left the present day civilisation and had suddenly reverted back to the Edwardian period with no radio, television and no transport for almost a week and we were now castaways in a large sandstone castle miles from anywhere with no contact with the outside world. Settling in, I had arranged that we all took it in turn to cook an evening meal as there was no going out to a restaurant. There just weren’t any. Our dining room consisted of a long table around which hung paintings of Highland scenes and an array of stag’s heads. Chandeliers emitting a dim light hung high above the table and over meal times our little group of seven were dwarfed in such a room. As for our entertainment, we took great amusement in John who being an amateur thespian took great delight in his ‘public addresses’ from the end of the long table. “Would the right honourable gentleman pass the salt” he would cry, then the cruet would be slid down the long table as if we were playing temping bowling. 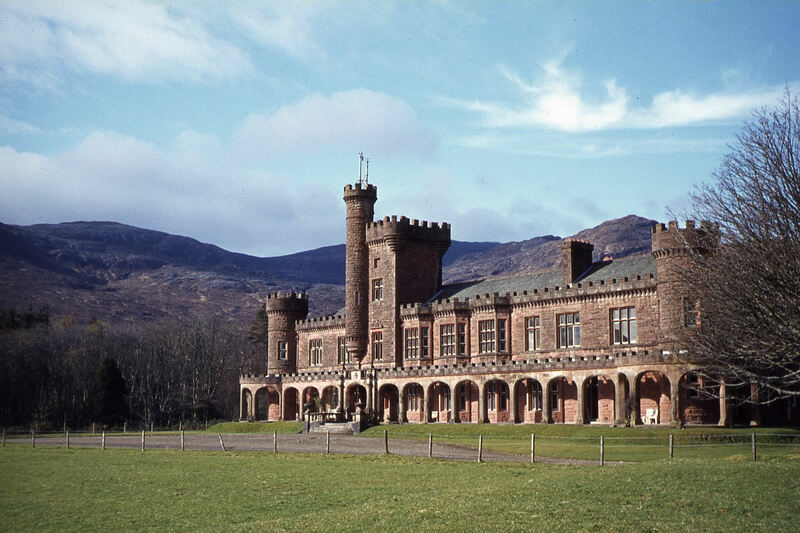 Now Kinloch Castle has a fascinating history, not that it is all that old. Building work began in 1897 and all stone was imported from a sandstone quarry on the Island of Arran. Some three hundred craftsmen worked for three years constructing this state of the art building with all the latest inventions of the day being incorporated. It was the first private residence in Scotland to have electricity and a dam was built high on a stream above the castle to generate hydro electricity. But who was paying for this? We now have to turn to the Lancashire town of Accrington, home of the wealthy industrialist George Burrough who inherited along with his step brother half of his fathers’ business. His grandfather of humble beginnings had set up a textile business in the town and his father had grown the business into a big success and had improved the power looms in the factory. George’s father, John had a flair for business and the company went from Strength to strength and in its heyday employed over eight thousand workers. John Burroughs initially rented Rum as a sporting estate and later bought the island. 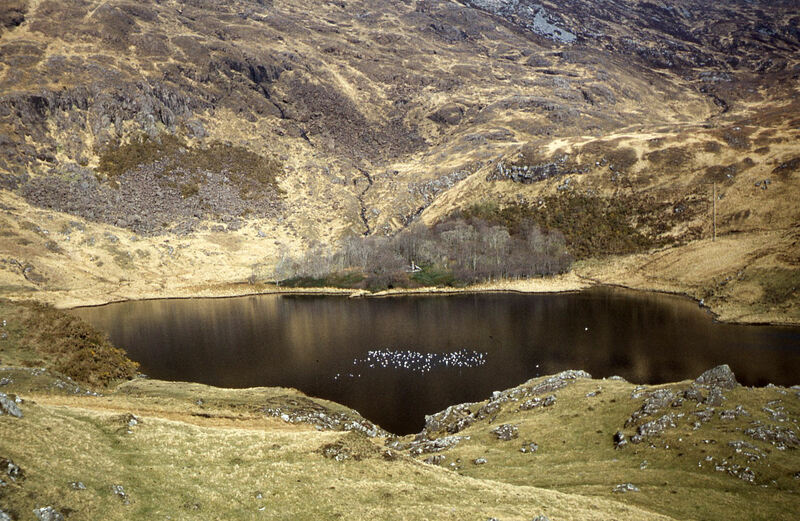 He died relatively young and the island was left to his son George whilst his other estate in Glen Lyon on the Scottish mainland was left to his step son. George Burrough had big plans and Kinloch Castle was built to replace a small hunting lodge but as well as building the house, he had exotic gardens laid out with 250,000 tons of soil being imported to the island. The extensive gardens for which twelve gardeners were employed included greenhouses where fruits more associated with the Mediterranean were grown and a palm house which was reportedly full of humming birds turtles and small alligators. The interior of the castle was lavishly furnished with no expense spared but the heyday of Kinloch Castle was relatively short due to the outbreak of World War I after which the castle was frozen in time. One unusual feature in the castle is the Orchestrion which is an electric organ driven by an electric motor that perforated card rolls. The organ was built around 1900 and apparently was destine for Queen Victoria who planned to install it in Balmoral Castle, but she died before it was complete and so it ended up here in Kinloch Castle. In 1957 the castle and island was bought by the Nature Conservancy Council for just £26,000, the equivalent of roughly £1 per acre. Restoration work on the castle is ongoing to this very day. As for our stay, we had planned several fairly strenuous walks and hoped to climb the Rum Cuillins on the day of the best weather. Setting off on the first day, we struck out west up the track through Kinloch Glen which runs into the heart of the island. Leaving the stony track after three miles we climbed into rough country and ascended the scree covered slopes to the summit of Ard Nev. Heading northwest we next made for Orval which at 571 metres was the highest summit of the day and afforded some excellent views. At a nearby sheltered spot we stopped for lunch. Continuing west we made for Sron an t-Saighdeir and here the moorland drops over 500 metres to the sea in less than one mile. Heading south we now made the long descent to Harris Bay on the south western side of the island. This is a lonely spot but is dominated by the Mausoleum. Built early in the twentieth century in the form of a Greek Temple it was erected by the Burrough family. This idyllic resting place for the family has been battered by gales and faces the full force of the Atlantic weather. At our time of visit it was in a poor state of repair. We now had a very long walk back across the island on a stony track to complete this sixteen mile walk. 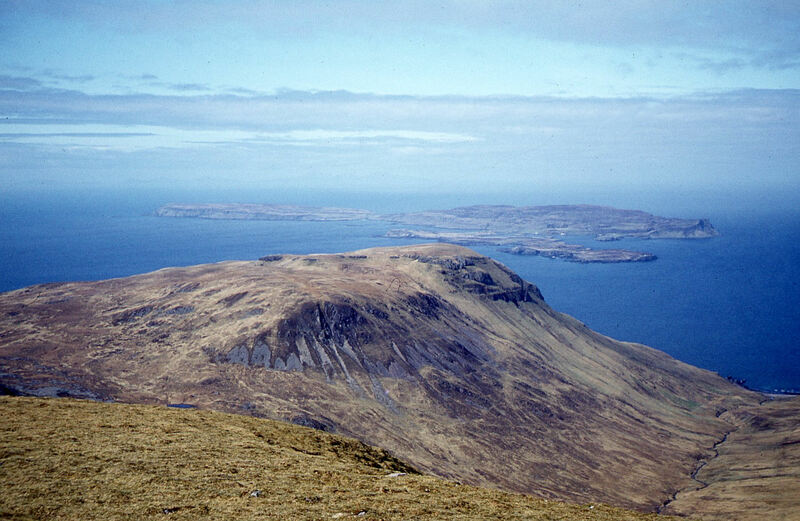 The view towards the Island of Canna from the summit of Orval. Lonely Harris Bay and its Mausoleum. Walking doesn’t get much more remote than this in the British Isles. 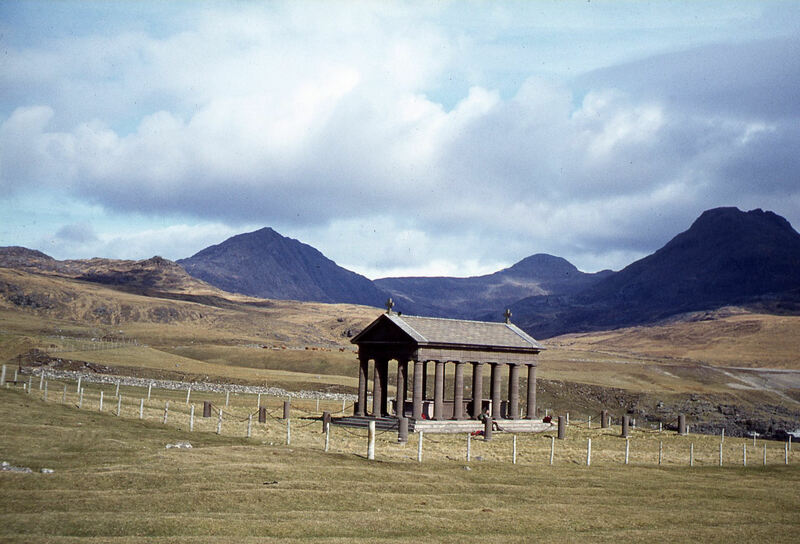 The Mausoleum at Harris. Now its a long walk back across the island. Day two was an equally demanding walk with a trek up through Kinloch Glen again before taking the lonely path down through Glen Shellesder to the coast by which time it was our lunch stop. Trekking southwest along the coast we came to the deserted settlement of Guirdil which faced out towards the Island of Canna. The bay had a few roofless dwellings at the time of our visit but today there is a bothy there. The next part of our walk presented a challenge. Heading up Glen Guirdil we had to find a way up onto Bloodstone Hill on our right and eventually we found a gully which we zigzagged up to the 388 metre summit. 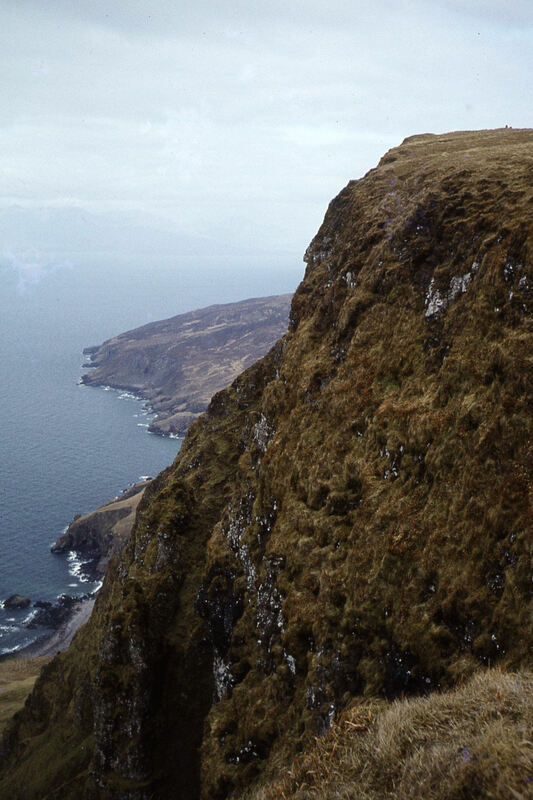 Here the cliffs plunge directly down to the sea. At least from the top there was a path back to Kinloch Castle which squeezed through the gap at Bealach a’ Bhraigh Bhig and hemmed in between the rocky slopes of Orval and Fionchra. It had been another long day with over fifteen miles covered. 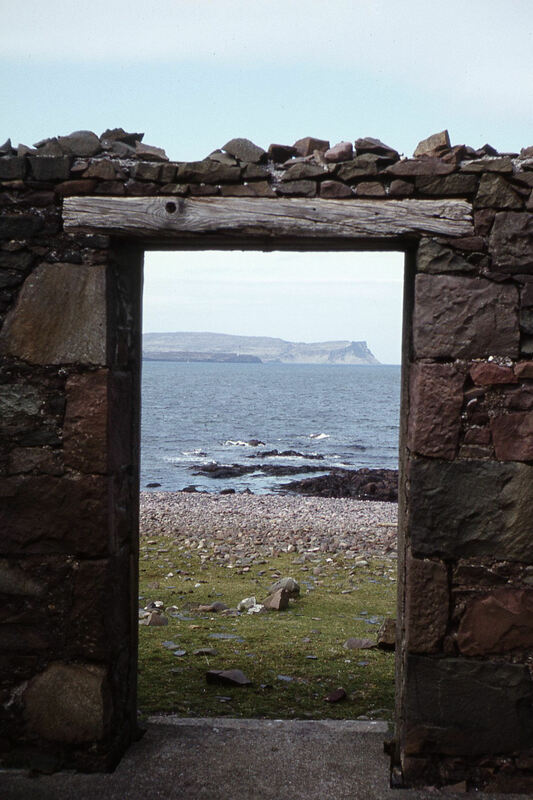 A view from the front door from a ruin croft at Guirdil. In the distance is the Island of Canna. The 380 metre high cliffs at Bloodstone Hill. The name wouldn’t look out of place on a pirate’s map. With no radio and not knowing what the weather would do, we decided to go for the Rum Cuillins on day 3, and today we split into an A and B parties. With me leading the A party, three of us were going to attempt the whole ridge. Cloud was down on the higher summits and we were hoping that this would lift. From the castle grounds we left the woodlands and took a path up alongside Allt Slugan a’ Choillich which proved to be rather muddy and slow progress was made. 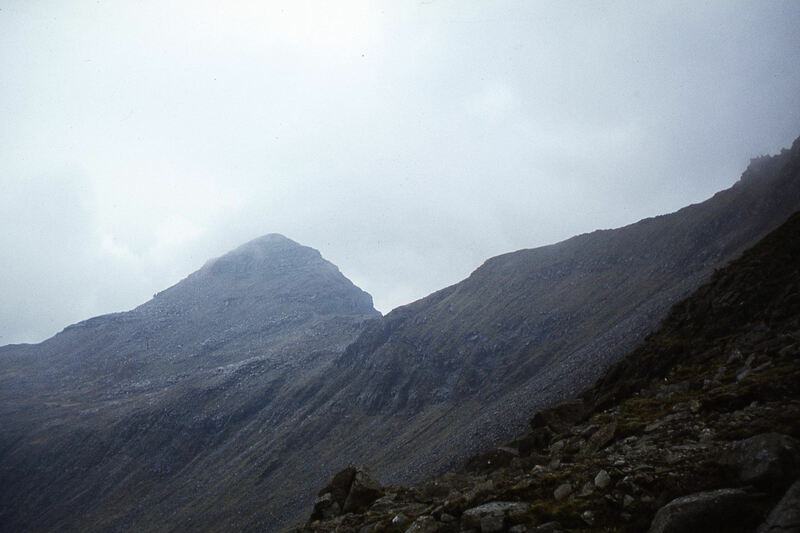 We eventually reached Coire Dubh and veered left to reach Cnapan Breaca. The ‘B’ party led by John’s was not far behind us but going at a slower pace. Continuing south we reached the ridge leading up to Hallival and the last 150 metres proved a steep climb with many boulders to negotiate. Furthermore, the summit was in cloud. Other people were on the mountain and we were surprised to see so many. From the summit we set off south with an equally difficult descent to the col. Ahead lay a short stretch of easy walking but in the mist there were no views. Starting the ascent of Askival we were soon confronted by a rock wall going skywards. Was this the end of our walk? From conversations had at Kinloch Castle, the way ahead was to the left (eastern side). We edged our way along a steep slope over boulders with a rock wall on our right and nothing other than mist on our left. We picked our way upwards passing a number of Manx Sheerwater nests. This area is part of their main breeding ground with over a third of the world’s population in this area. We eventually made the 812 metre summit of Askival after a scramble. Views were nil so we didn’t hang around for long. Westwards we descended to Bealach an Oir, which was just below the cloud base and above the col we stopped for lunch. At Bealach an Oir we came across John and his party so we were puzzled how they managed to get ahead of us. Apparently, John had taken a wrong compass bearing and had dropped to low from Hallival and as a result had missed out Askival altogether. Shortly, my little group pressed on to bag Trallval 702 metres and this proved another steep climb. The summit ridge was so narrow that it would have been difficult to pass another person. The summit too was very small and we took it in turns to stand on the highest point. On all sides the slopes fell away steeply into the mist and it was such a pity that we hadn’t got any views. Our descent was southwards down to the col at Bealach an Fhuarain and this too proved to be a steep descent. In the col we turned left to walk down Glen Dibidil following the river much of the way. Reaching the coastal path, we turned left to follow the path back to Kinloch Castle. It remained a dull afternoon and despite not bagging the whole ridge, it had been an excellent walk. On the Rum Cuillins with a view towards Hallival. We had traversed the ridge from left to right. It was our last full day on Rum and by now most of the group were tired having done three days of strenuous walking. John and myself were both keen to visit the allegedly haunted Papidil Lodge which is located on the southern end of the island but this meant a walk of eight miles to get there and eight back via the easiest route. It wasn’t an early start and this made us late all day. Leaving Kinloch Castle, we initially followed a nature trail before a gradual climb to over 200 metres. The morning was dull and grey with the mountains firmly in the cloud. The going wasn’t that easy with several streams to cross. I kept leaving John behind and had to wait for him several times. The Dibidil River had to be crossed and this wasn’t that easy. Afterwards we dropped down to have lunch by Dibidil Croft. The building was used as a centre for local climbs. With time pressing we continued towards Papidil Lodge but at times we thought that we might not reach it. A stony path was followed to Loch Dubh an Sgoir. It was a long gradual descent before the ruins of Papidil Lodge came into view. I surged on ahead the last half mile. The ruined lodge lay among a group of trees. Approaching the lodge I walked through some woods. There was a strange atmosphere as if I wasn’t alone. For the first time today the sun had come out and shone brightly. I wandered through the ruins walking from room to room in this once grand house. Furniture had been left in situ and shafts of sun light shone though the partially collapsed roof. It was a sheltered and sunny spot below Sgurr nan Gillean. John joined me to explore the ruins and nearby we sat awhile for a break close to the shore and Loch Papadil. With over eight miles to get back it would take us five hours. By the shore we stared out over an empty sea. Lots of driftwood and planks of wood littered the shore. Enough to make a boat and leave our desert island we thought. From this idyllic spot we knew we had to return to Kinloch Castle. Heading back we opted to take a slightly higher route to reach Dibidil passing this time to the north of Loch Dubh an Sgoir. To our south east the island of Eigg had been bathed in sunshine all day. By 17.00 hours we had reached Dibidil. Towering above Glen Dibidil was Askival now bathed in afternoon sunshine. I was often some distance ahead of John but stopped periodically to wait for him. I re-crossed the Dibidil River but John opted to cross the river elsewhere and as a result fell in. I next saw him wading through heather with a boot and a sock held in one hand. We soon decided that I should press on as we were expected back by 18.30 hours. John would press on slowly. I set off at a quick pace crossing rough countryside and covered then remaining five and a half miles in one and three quarters hours. We kept a meal for John who surprisingly turned up just a half hour behind me. The dark waters of Loch Papadil. Behind in the woods stand the ruins of Papadil Lodge. Haunted or not haunted, we felt that we were not alone as we explored the ruins. On the eight mile walk back from Papadil Lodge to Kinloch Castle we had this view towards the Isle of Eigg. For the last full evening at Kinloch Castle I had arranged the group to be given a tour of the building. It was just so amazing that a building of this stature was located in such a remote location. If anything, it would have made a good film location of Harry Potter’s Hogwarts Castle. From room to room we wondered around in amazement and through the castle packed with memorabilia that George Burrough had collected during his tours around various parts of the world. We were given a demonstration of the Orchestrion. The clarity was so magical and like an indoor fairground organ. The great hall had a ceiling painted in a heavenly blue and studied with stars. With the whole island being supplies by the hydro electric supply which was originally destine for the house, islanders always knew when the lights in the hall were switched on as the lights on the rest of the island dimmed. It was soon time to leave Rum and with the group and other lined up on the jetty the following morning for the return journey back to the mainland and back to the present world. Overall it had been a magical experience.